How is Search Spam Defined? 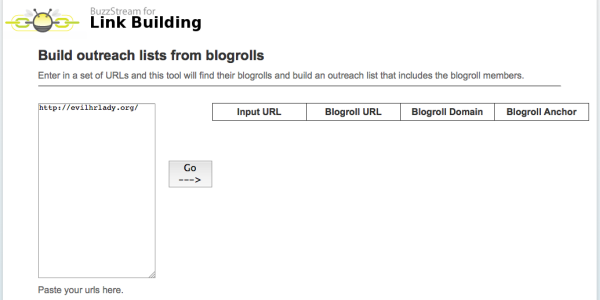 Here are some quick tips on how you can use blogrolls to compose a list of as many related blogs as possible, then checking those blogs to see if any of them return 404s. 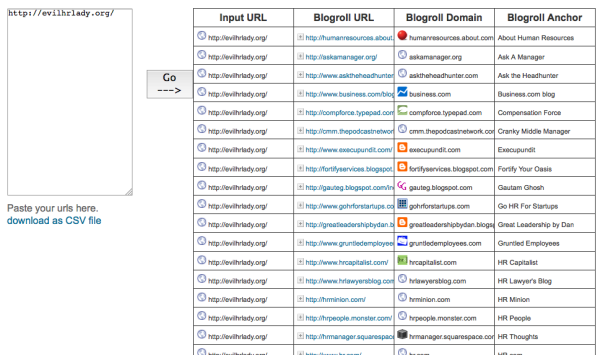 A good free tool to use for finding blogs is the SoloSEO link tool, which will pull up blogs (and other assorted advanced search operators) based on the keyword you input. After going through the ways to build the list, I’ll run through a few ways you can use it. Start off by finding a few related blogs that have blogrolls. The more blogs & the longer the blogrolls of each, the better. This is our seed list that will soon multiply itself. Next, download the results as CSV. Open it up in Excel, then copy & paste the blogroll URLs back into the list builder tool (you might have to refresh/reopen the page). Keep doing this until you have a sizeable list. The bigger the better, but as you keep expanding, you’ll run into the issue of irrelevant blogs entering the list, so just keep that in mind. 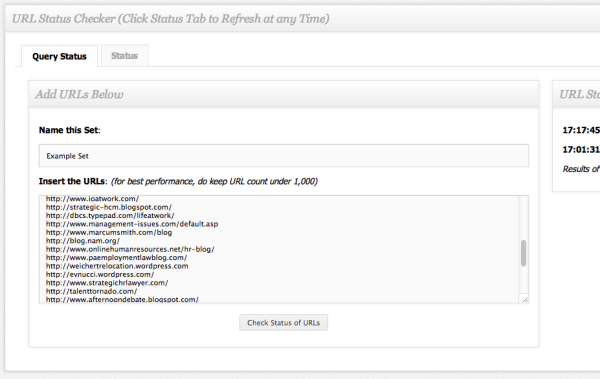 Next, throw your list of URLs into Citation Lab’s URL Status Checker tool. This will check to see if any of the URLs in the blogroll are 404s. Once the report is finished, you can export it as a CSV. Go down the list of 404s and plug them into any of the bigger link tools on the market, Open Site Explorer, Ahrefs.Com, or MajesticSEO. Scan their top links for any that are coming from a homepage. These are almost always blogroll links. Go to these homepages and use the Check My Links chrome extension, because if one link in their blogroll is broken, then there’s usually a few others. From there, reach out to the bloggers letting them know of the broken links. Then ask them if one of them could be replaced with a link to your blog since it’s related. Once again, plug the 404s into the link tool of your choice. 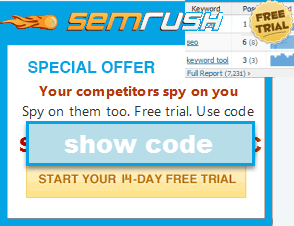 This time however, instead of checking their links, click on Top Pages section in the tool. Find their most linked to content, double check each to make sure the page is no longer available, then plug those URLs into Archive.org to see what content used to be there. Next you’re going to rewrite the content, but do your best to make it even better. If it’s a little outdated, then update it. This content will not only attract links on its own with proper promotion (the old one did, the new one probably will as well), but you can now use this for broken link building. 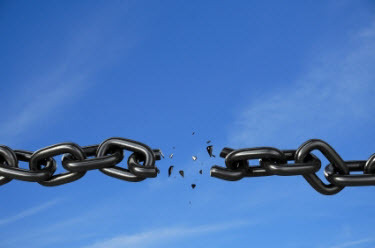 Take the URLs of the broken, linked-to content and plug it into your link tool(s). Go down the list and find the most valuable links to that content, then reach out to the webmaster/blogger of those sites and let them know that page is broken. Tell them that “you took the burden” of recreating it, and that for the sake of their readers, they should update the broken link by now linking to you. If they have enough links to them, you can put some content up and include a few links back to you. If you’re going to do this, make sure you put content up on their Top Pages, since these are already loaded with link juice. Finally, you can take that list of blogrolls, remove all the 404s & duplicates, and use the Mozscape API (with excel) to find the most authoritative blogs in your niche. From there, build relationships, ask for product reviews, or anything else you can think of. So many of the tools we have ready at our fingers can be used in various combinations. Don’t be afraid to experiment. What do you think of this process? What do you think can be improved? I’d love to hear your thoughts below! Jon Cooper is an SEO consultant and the author of Point Blank SEO, a link building blog. Follow him on Twitter @pointblankseo. Got to know about some important tools for SEO blogs and about would surely gonna implement this technique. Great article, Jon. Always nice to see someone putting a new spin on techniques. How do you feel about Citation Labs' new tools? Do you use them? Do they make the process easier?